Khabra and Jason’s elegant wedding in Nashville is one for the books! They began their beautiful November day at the lovely Union Station Hotel in downtown Nashville and ended it with a spectacular reception at the Frist Art Museum. And so much more in between! For those who haven’t visited the Union Station Hotel, it is a visual feast! Luxurious ceilings, gold-leaf cornices, and beautiful archways abound and massive chandeliers fill its three-story high lobby. A former railway station more than a century old, the property offers a host of delights from a bygone era. After the last getting-ready touches, Khabra and her bridesmaids gathered downstairs under the arches. The emotion was high, watching Khabra transform into a beautiful bride before our eyes! These portraits before the ceremony are always so much fun because there is anticipation in the air. Everyone is giddy with anticipation, and giggles and smiles come easily! Khabra and her bridesmaids, along with her sisters of honor, were dazzling in their array of purple and white. And while it was a lot of fun to watch the girls making over Khabra and enjoying themselves, the highlight was Khabra’s first look with her father. There is something so real about that moment, that gets me every time. They looked at each other and sweetly embraced. As an added plus, you can tell that the soft blanket of light in this front lobby just makes everything shimmer! I hadn’t shot there since late 2016 for Brittany & Chris’s fall wedding, and honestly, I cannot wait to go back! Later the groom and groomsmen gathered for their portraits on the historic train platform. And with perfect timing! The late afternoon Nashville skyline softly turned to pink just as we finished the last few photographs. Later, Jason watched with tears as his gorgeous bride walked down the aisle. 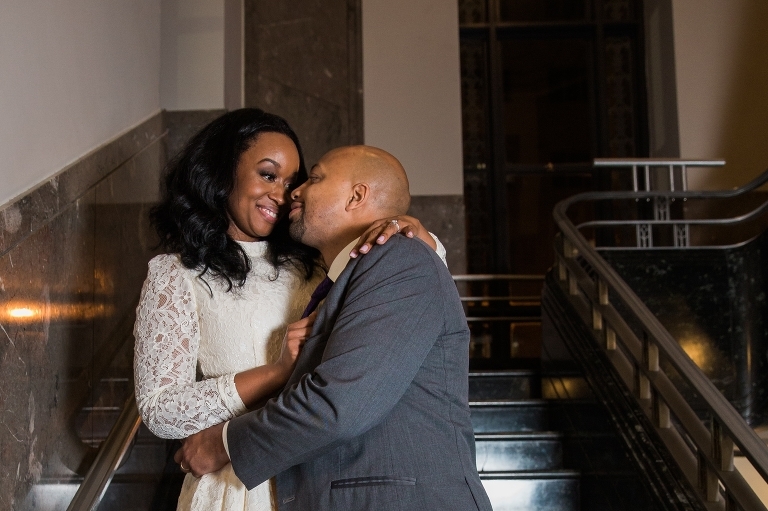 Khabra and Jason said their vows inside the historic Fisk Memorial Chapel. Afterward, the wedding party and guests traveled to the Frist Art Museum for an unforgettable reception. As a special touch, the Frist’s Paris 1900 Exhibition was open to all the guests during the cocktail hour! From morning to night, every detail of the day was carefully styled to celebrate the joy of Khabra and Jason’s wedding day. 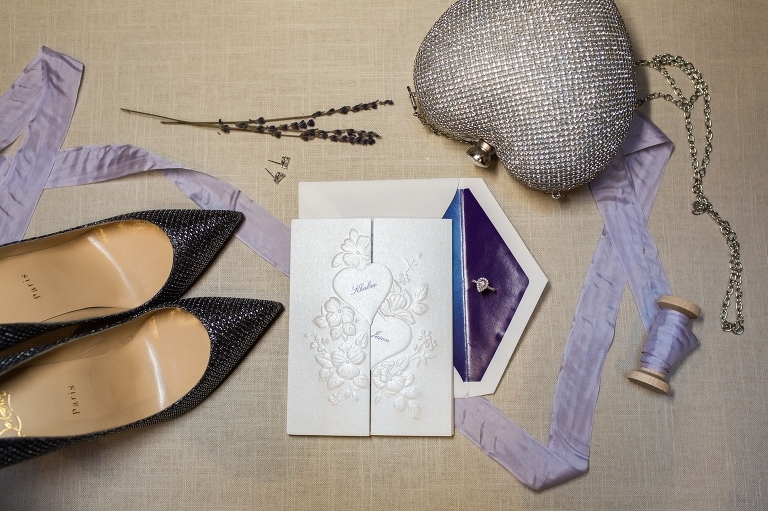 The color scheme of deep iris and silver was carried out in every touch, from the bridesmaid gowns to the florals (by Perri Crutcher of Gulchi and Gulchi) and dinner napkins. Artistic purple uplighting in the dining room created a cozy elegant feel. The couple’s wedding cake featured a trellis of purple florals, and even the cake knife was personalized for the occasion! Of course, beautiful details are eye-catching, but the real excitement in the air surrounds Khabra and Jason’s true love for each other. You only have to see how she melts in his arms to know that with him, she is “home.” My favorite part of any wedding day, are the bride and groom portraits, and this couple had the opportunity to create some stunning ones inside the historic art deco Frist building. This building is quite unique in Nashville. It was constructed in 1933 and its interiors feature cast aluminum doors and grillwork, as well as colored marble and stones on the floors and walls, according to the building’s literature history. Khabra and Jason enjoyed a quick getaway from the swing of the party to create some striking portraits in one of the Art Deco stairwells. My only wish is that we could have stayed there all night!